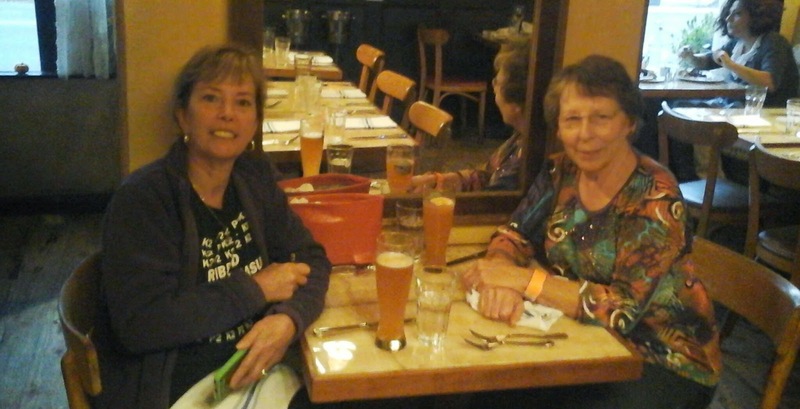 After all my Rhinebeck travel posts, I thought it time I delivered some knitting news. Especially since Fred and I leave soon for a week in Utah and Arizona. 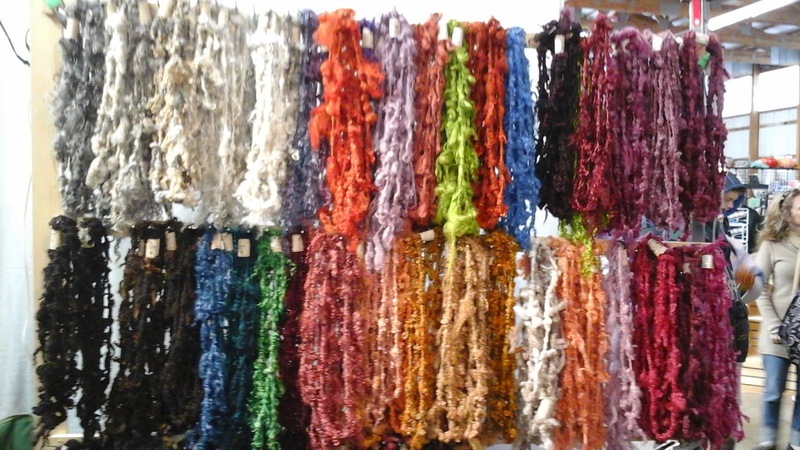 Places we have not yet visited and cities filled, hopefully, with unique yarn stores. Ooops. Fred doesn't know that yet. Anyway, in between my travels, there has been knitting. You might remember that I was working on Radicchio, in an off white cotton/wool blend purchased at the Maryland Sheep & Wool Festival. I was partly finished one sleeve by Thanksgiving weekend when something wonderful happened. My niece, adult niece I might add, asked if I would knit her a sweater. Whoo Hoo, would I? No need to ask twice. She is a young Mom and that brings with it several sweater requirements. It must be washer and dryer friendly, not itchy, expansive enough to cover the hips that blossomed through child birth, and of a colour that disguises spit-up. A pretty young woman she is with blond hair, clear skin and rich brown eyes. I think I have just the thing: Cotton Tweed - the cotton/acrylic blend that can be washed and dried for years to come and still look good. Rich, deep brown to enhance her eyes and resist showing spit-up. A bit of denim blue here and there to make it youthful. Although the camera shot below doesn't make the blue look too denim-y, in reality it is. from Button Up Your Top Down. When viewing cardigan patterns on ravelry, my niece seemed to gravitate to those sweaters that had contrasting buttons. To make that effect even more 'cool', I am working the trim in the contrasting denim and will put dark brown buttons on the blue trim. I am excited to knit, finish and present her with the sweater. I hope my vision matches hers. Routine, especially my Thursday afternoon routine of going to knit group, feels great. 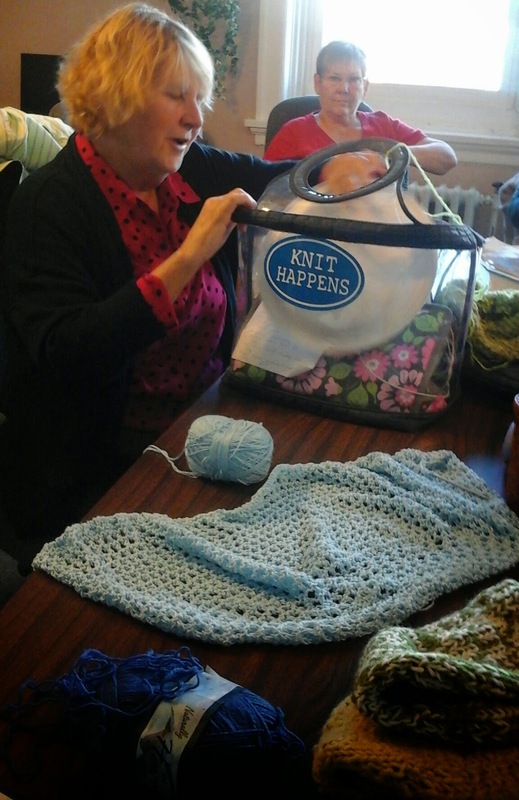 Soon we will lose our snowbirds so it was good to see their knitting today. Sharon and Gail are sock absorbed today. 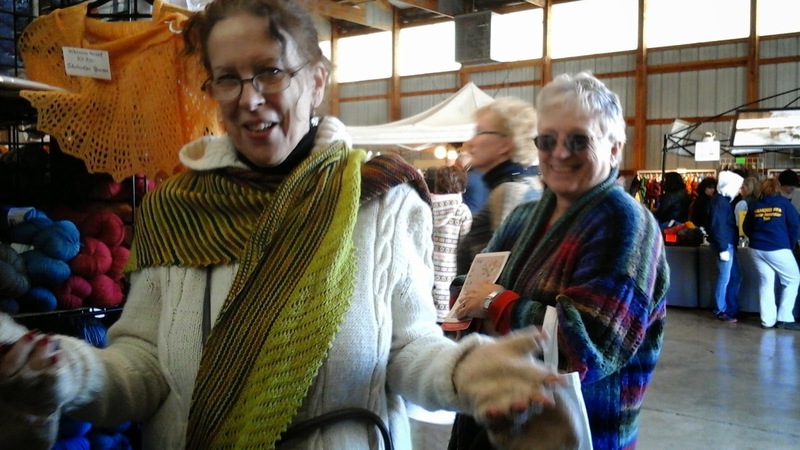 And doesn't Sharon look great in her cotton, Knitters Fair shawl? She says she has started shawl number two but brought socks to knit group. 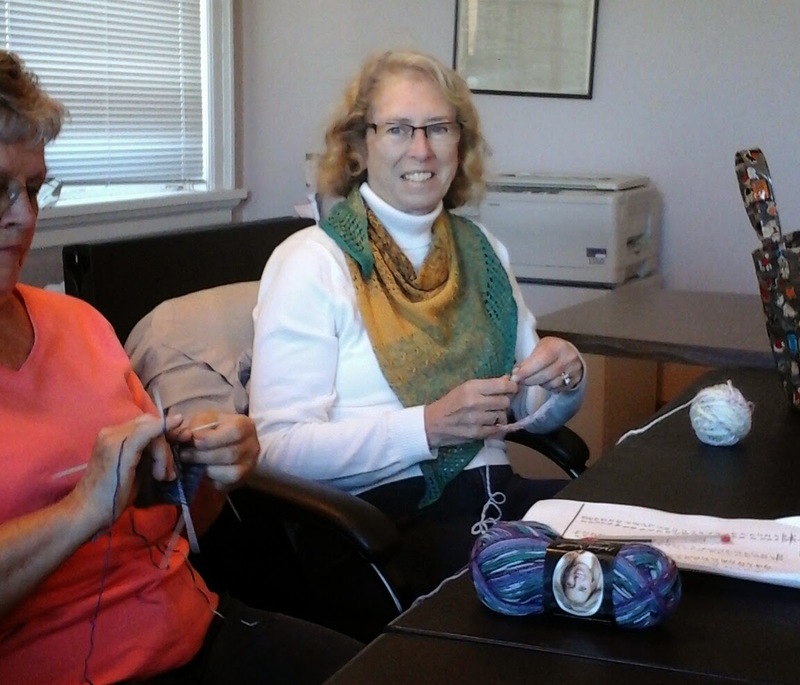 Nicki and Lorrie both worked on socks today - but here they are sidetracked by the librarian. Who wouldn't be sidetracked? She brought us candy. 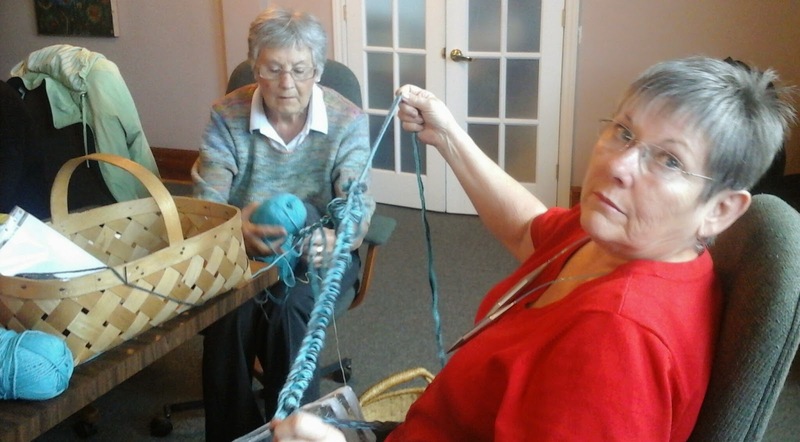 Wilma brought her finished 'big yarn, big needles' cowl. She had some bulky wool in her stash and borrowed Sandy's 15mm needles. 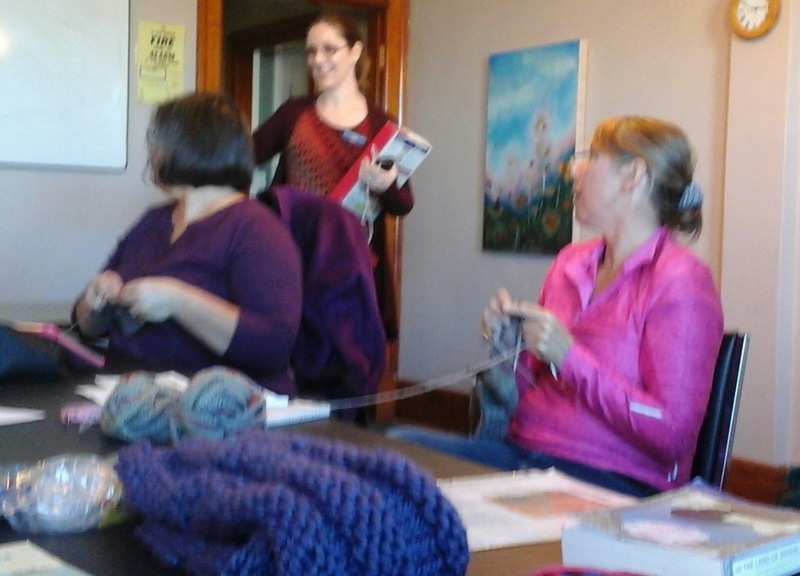 Those needles are making their rounds in this knit group. Thanks, Sandy. Nicki modelled it for us. A cowl this big is almost a shawl. Multi purpose. 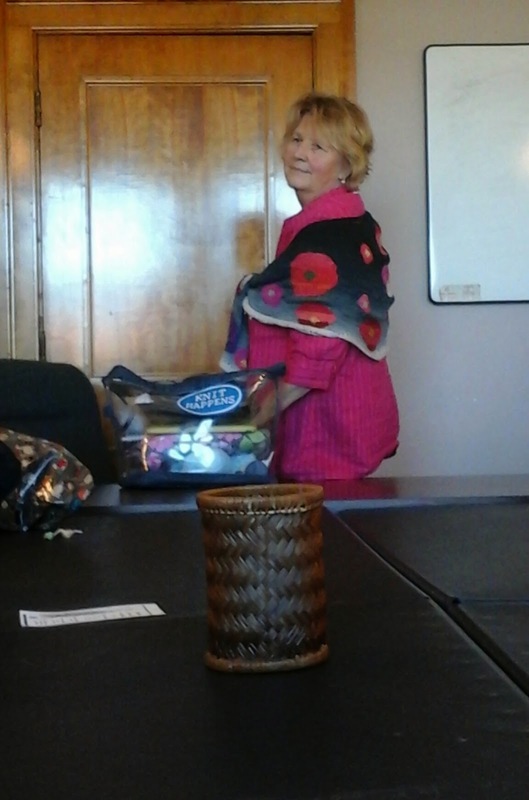 Speaking of shawls - look at the one Sandy is wearing. Knit by Sister Sue - the bag lady - it is fabulous. The other day, a reader emailed to say she couldn't access the comments section of my blog page. Today, blogger isn't letting me align the typing where I want. Perhaps time to change switch allegiances. 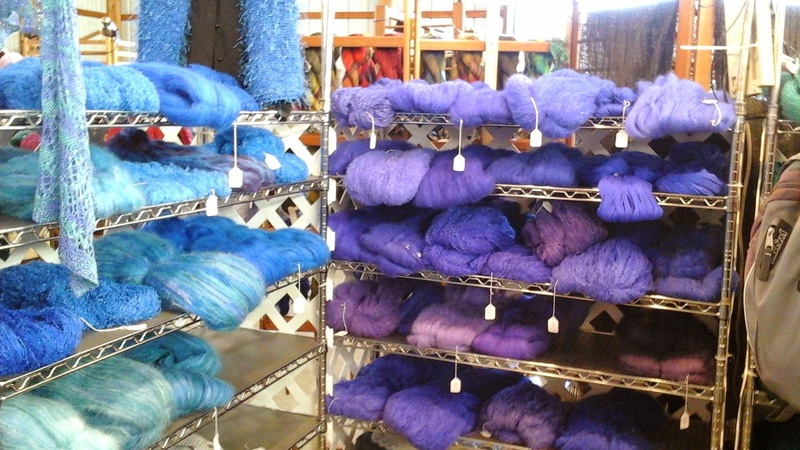 Last post about my trip to Rhinebeck. Promise. 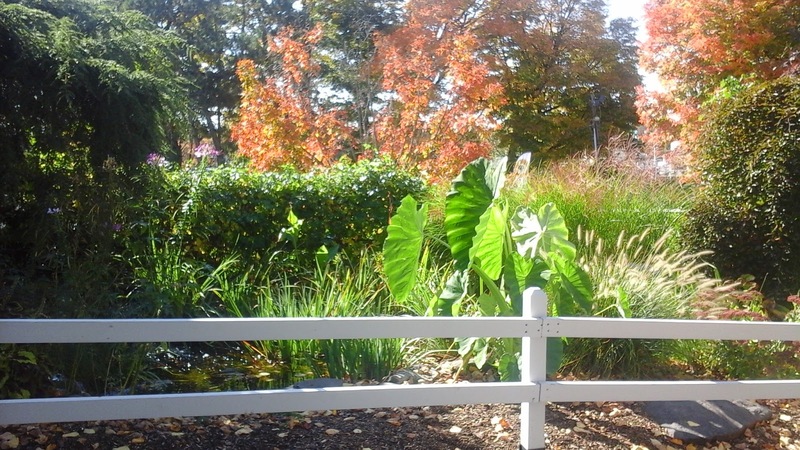 Rhinebeck is located in the Hudson River Valley. We crossed the river each day driving from hotel to show. The mighty Hudson from the looks of it. The area around Rhinebeck boasts rolling hills, curving, winding roads, hardwood forests and historic buildings - the Inn in the centre of town was constructed in 1766! A lovely place to visit at any time of year, it seemed to me. 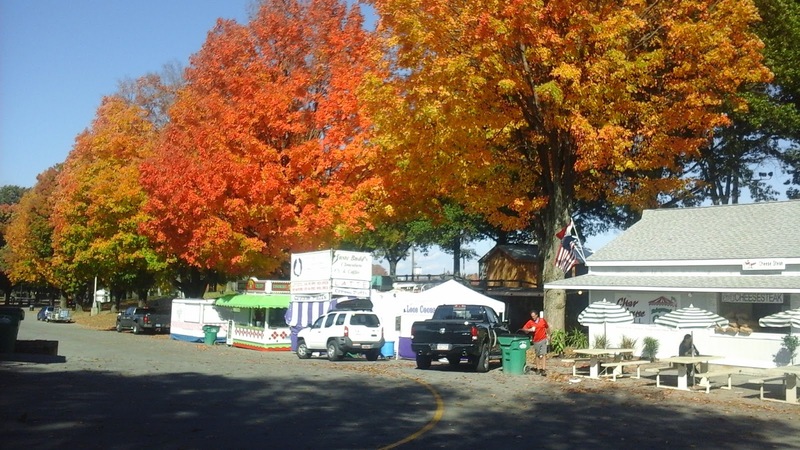 But the third weekend in October, it is home to what is reputed to be North America's largest Sheep & Wool Festival. 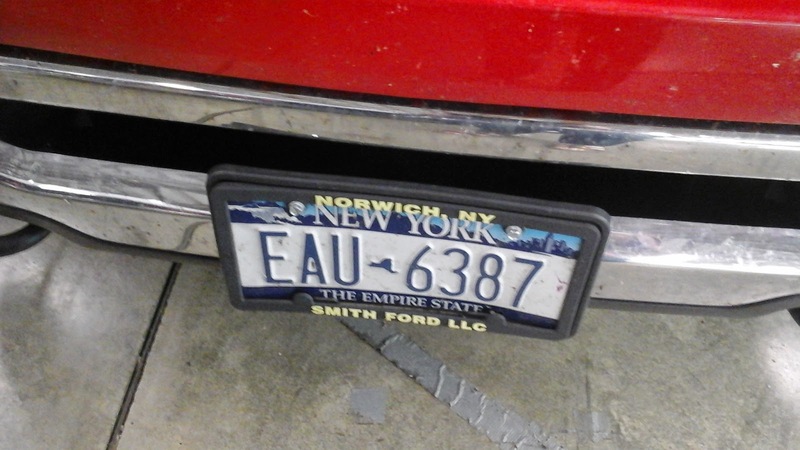 Some of the facts I learned while there, sure seemed to confirm that status. 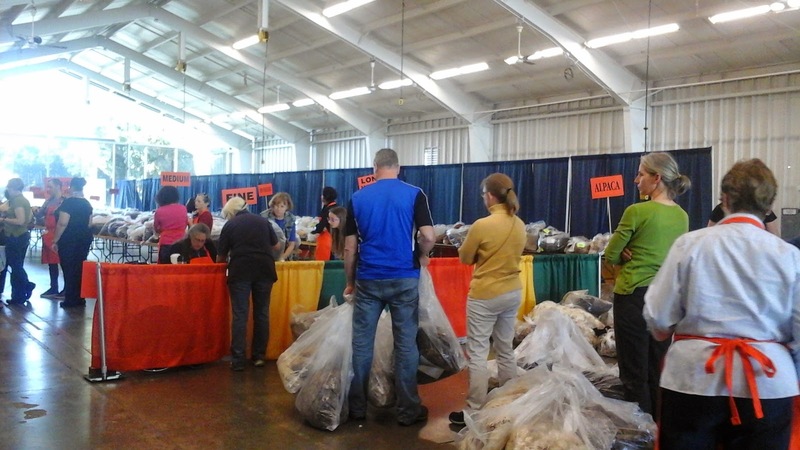 We spoke to a fleece judge at breakfast Saturday morning. 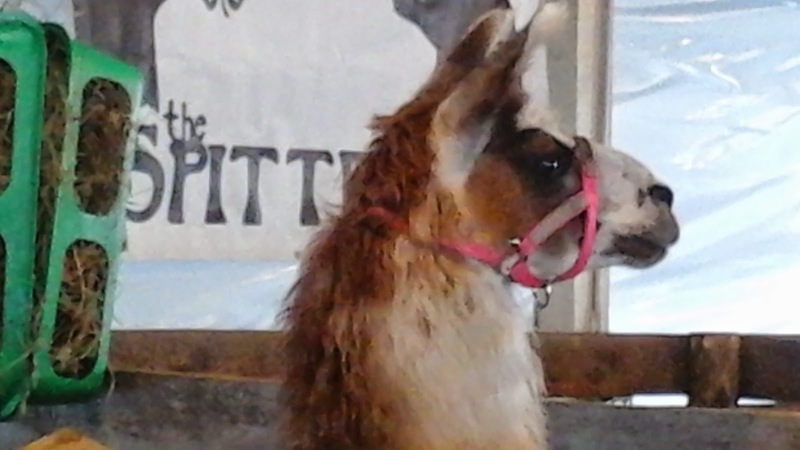 He said he judged fleece at the Taos Sheep & Wool Festival. There were 37 fleece. At Rhinebeck there were 681. The parking lot space totalled 50 acres. The size of a small farm. Our booth was in barn # 31. It took us an hour and a half to get out of the fairgrounds to the highway Saturday night. After waiting one hour beyond closing to leave. According to the number of sales slips for Saturday, we did a customer transaction every three minutes for the entire 8 hours. Considering these are the old-fashioned, 'che-ching', paper transactions - the electronic signal in a barn never works - most take longer than three minutes to write up. Therefore there are long lines at the cash. Saturday, there was no time to eat. At 4pm, a friend from my London Ontario days came by and asked "Do you need anything?" I replied that we needed lunch. We hadn't eaten since 7am. She volunteered to stay in the booth while I ran out to a food concession to buy us a couple of wet, soggy, tasteless 'beef on a bun'. Thanks, Sharon. 4pm was late - but sure better than never. Canadians from Port Elgin - ladies from Doc Knits, Creemore, Ottawa, Londoon, Toronto, Peterborough and Quebec City stopped by to say hi. When the few Americans commented on the 4.125% local, county tax we had to charge, we responded that we were from Ontario where shoppers pay 13%. Their response? "Yes, but you have health care." Just a reminder of our good fortune here in Canada. 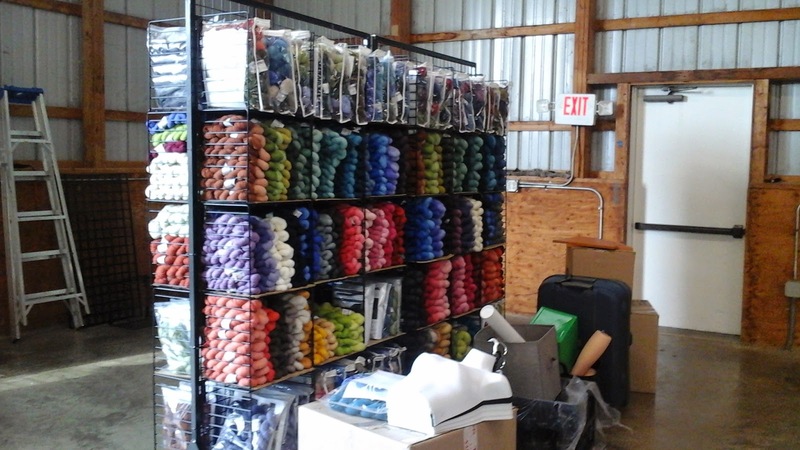 Although I never left our barn and didn't even get out of our booth until an hour before closing on Sunday afternoon, I did manage to capture some of the colours displayed in barn #31. Then it was 7 pm Sunday night. Our trailer was packed. 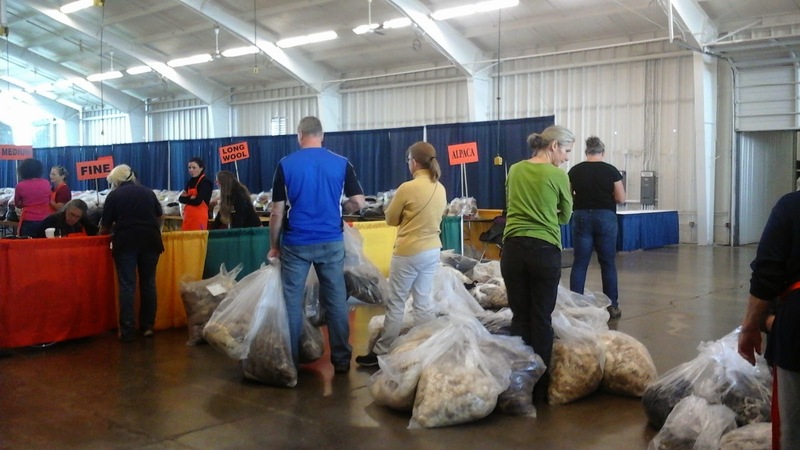 The fairgrounds were emptying. We started for home. Goodbye Rhinebeck. Rhinebeck again. Our weather at Rhinebeck for the most part was milder and dryer than here at home, beside Georgian Bay. But Sunday it changed. Although still sunny and dry, the temperature dropped and a cool breeze brought out everyone's woolies. Perfect attire for a wool festival. Here are a few of the most fabulous that stopped by our booth. The lady in the Norwegian ski sweater below, told us she scored the sweater at her local Good Will for $12. She was very proud. Her friend's hat is fabulous. 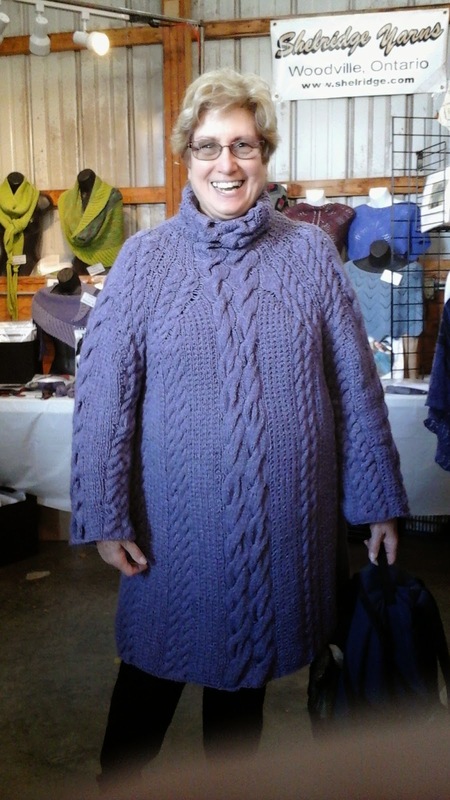 This knitter is wearing a Cameo, one of Shelridge Yarn's latest pattern releases in gorgeous colours. 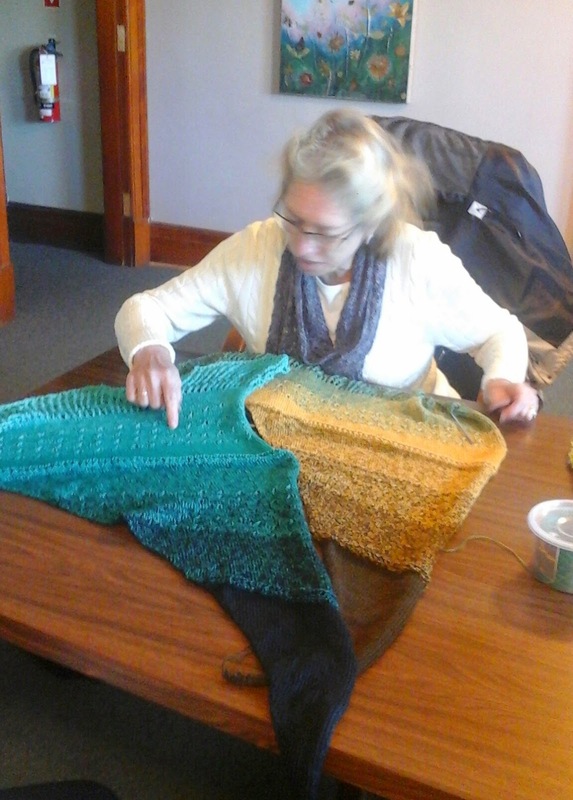 The last minute knitter below, sewed in her ends before leaving her hotel for Sunday's show. This is a Vogue pattern she said. Fabulous, fabulous, sweater coat. 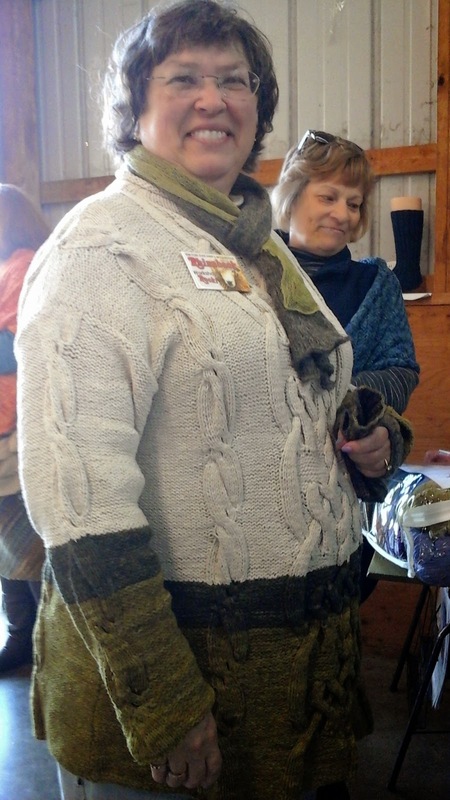 I loved how this knitter had a scarf that matched her sweater. 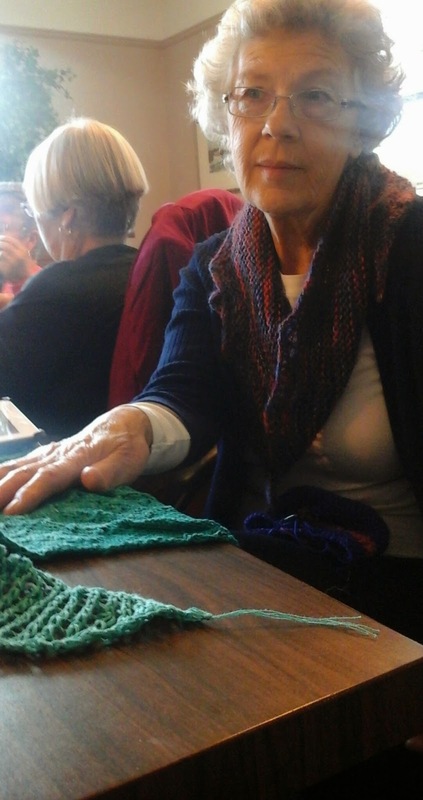 She knit the sweater and a friend knit the scarf for her as a birthday gift. 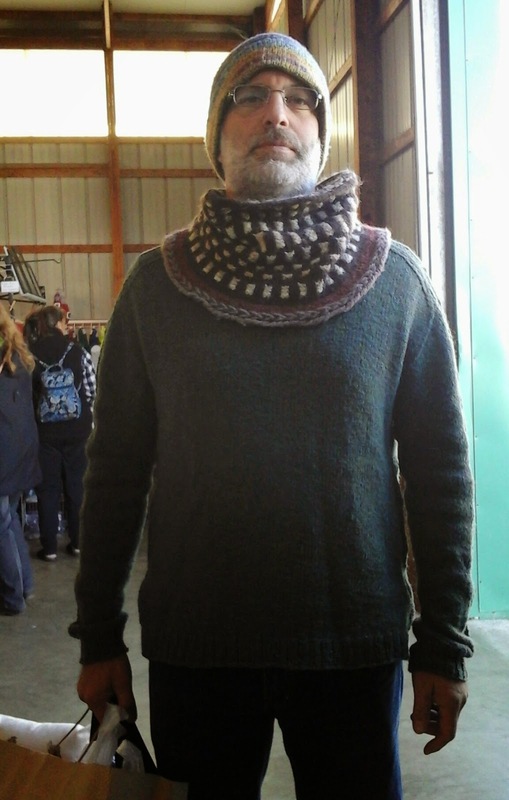 This fellow, wearing his wife's knitting, I had to chase after and ask if I could take his picture. Hand knit hat, Inspira Cowl that used up all the leftovers in her stash, the wife said and a hand knit sweater. I should have checked his socks. Below is my favouirte knit 'view' of the show. 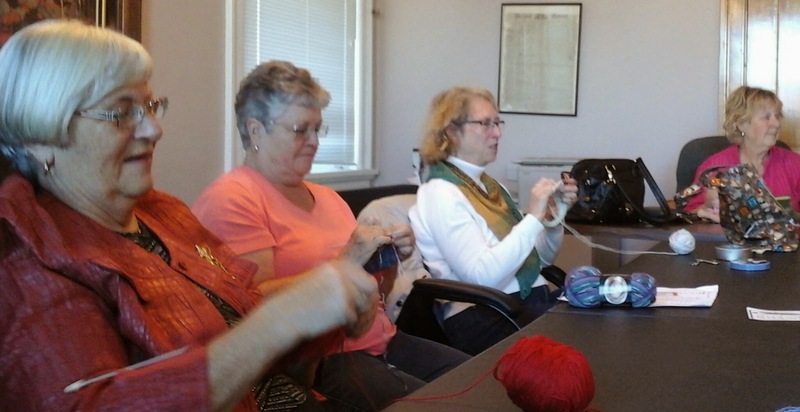 These knitters - look how young they are - met on ravlery, discovered they all live in the same area, formed a knitting club and now get together regularly to knit. 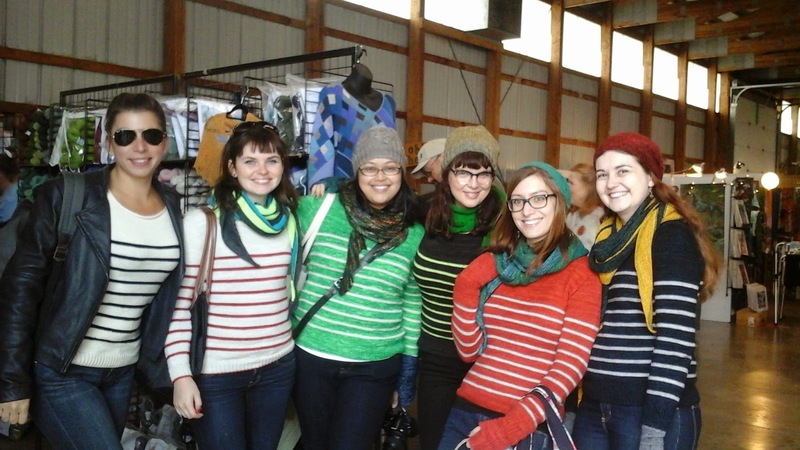 They decided to knit the same sweater pattern and all wear that sweater to Rhinebeck. Isn't that a wonderful story? 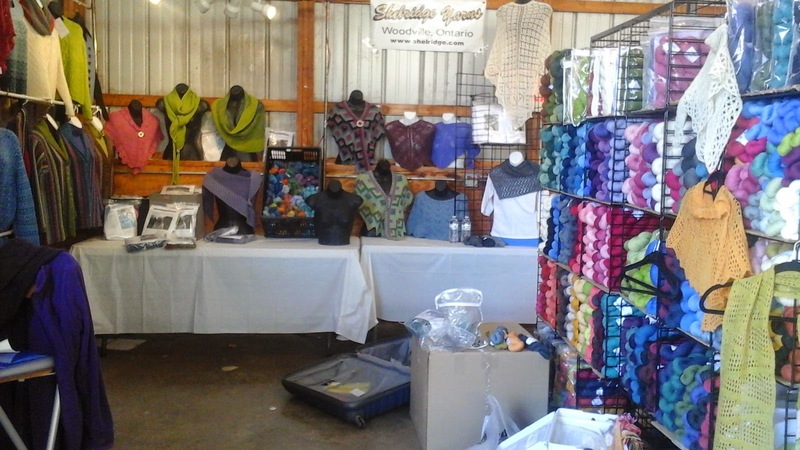 Day 2 at Rhinebeck is set up day. 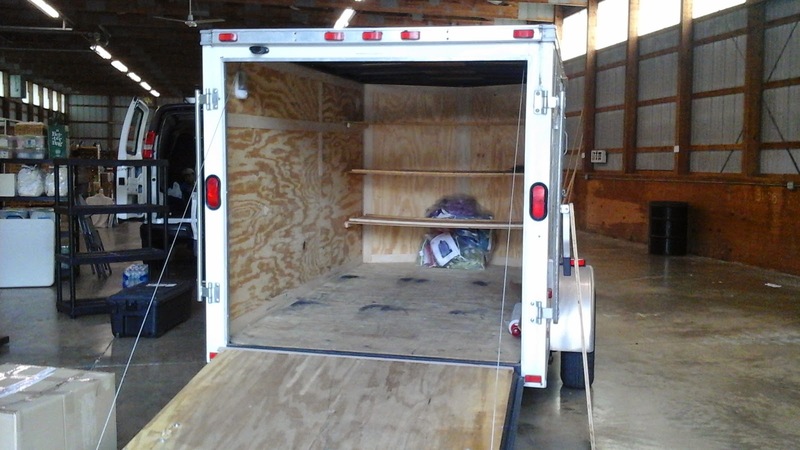 While we unloaded the trailer yesterday, claiming our spot, today we got down to the business of setting up the booth. The goal in booth set up is sales. Make it look attractive to customers. Make the customers want to stop and look at the goods. Make the customer buy your stuff. With our work done for the day, we took a stroll around the grounds. 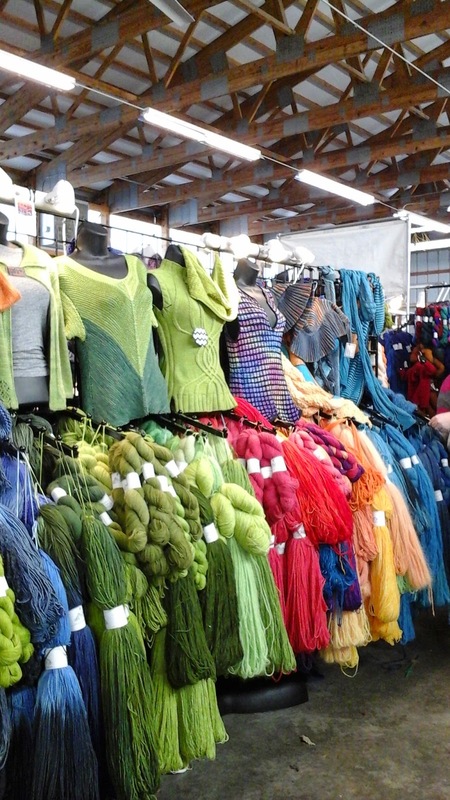 The New York Sheep and Wool Festival - known to knitters as 'Rhinebeck' - takes place at the local fairgrounds. Like no fairgrounds I've ever seen. 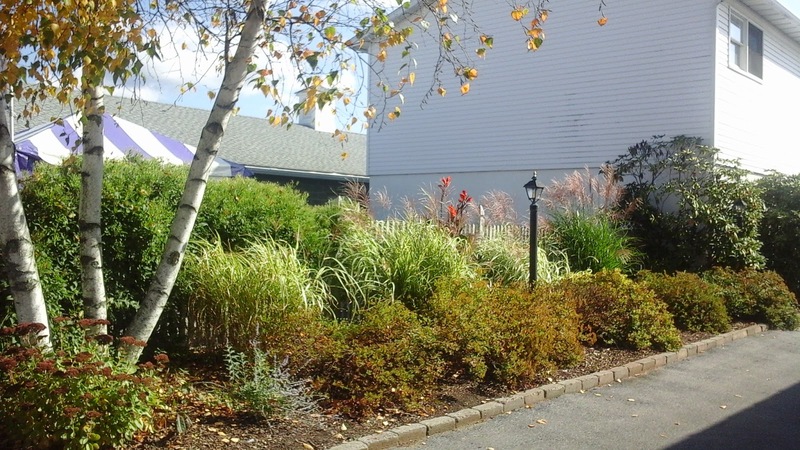 50 acres of parking and landscaping - who ever heard of landscaping at the fairgrounds? 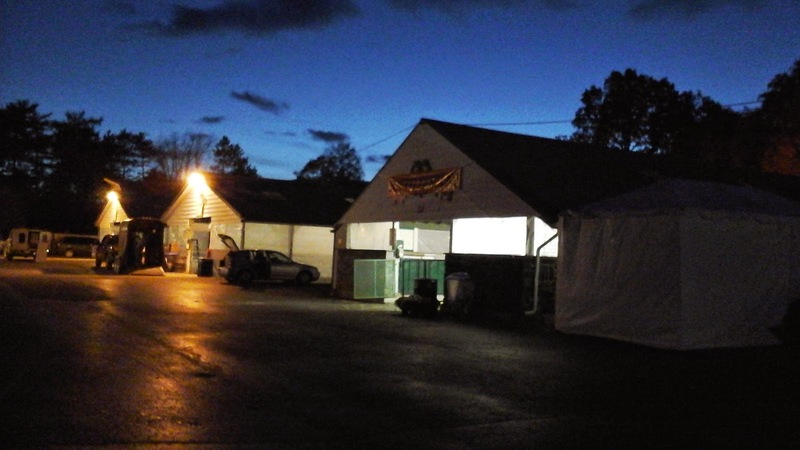 I leave you with some pictures of the fairgrounds. Look where knitting has taken me. No customers yet, the festival isn't open til Saturday. But no rest for the vendors. 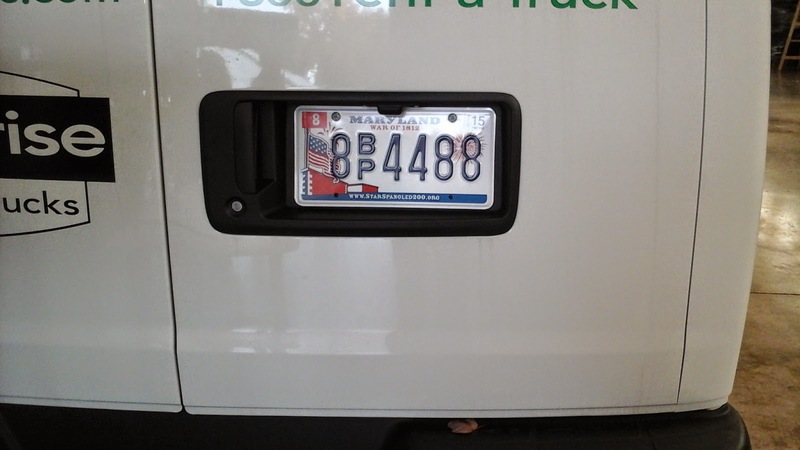 The secret to making a vendor's life easy in terms of set up, is to arrive early. If there aren't many booths already in place, one can drive their vehicle right into the show room. Miss that window of opportunity and it means a lot of carrying from the parking lot. and all our stuff is in our space. Not prettily placed yet, but time for that first thing tomorrow morning. Once our day's work was done, we took a walk around. I was amazed to see where all the vedors came from. was the perfect way to bribe the staff me for all the hard slugging tomorrow will entail. 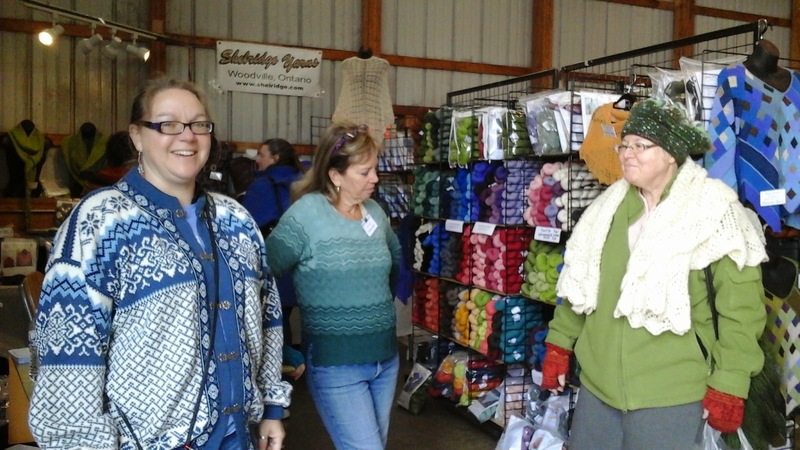 Knitters know Rhinebeck. Precisely, those connected to the 'net' at least know of Rhinebeck. Long on my bucket list, this year at last, I am headed there. 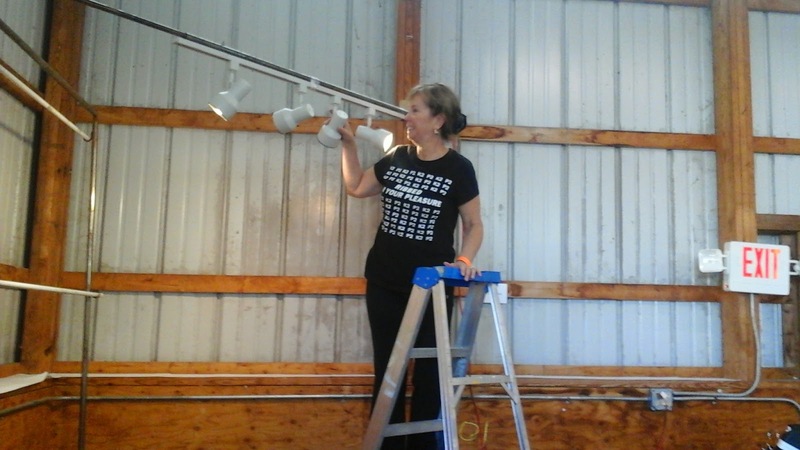 My time will mostly be spent working, helping Lyn Gemmell of Shelridge Farms with her booth as I did for the Maryland Sheep and Wool Festival in May. Work may be the first order of business, but Lyn, generous, fun 'boss' that she is, makes sure that I have shopping time. I have the American cash ready and have alerted my credit card company about the possible overload. But unlike most other Canadian knitters on their way to Rhinebeck, I have not knit a 'fair' sweater. 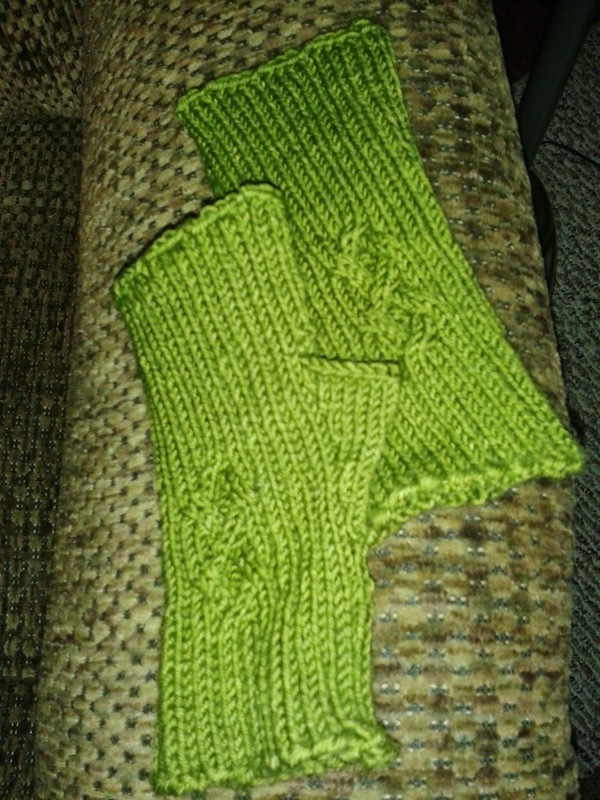 Instead I have knit 'fair' mittlets. Who is the clever knitter I ask you? I am travelling with my phone and tablet so pictures and blog postings will be possible. 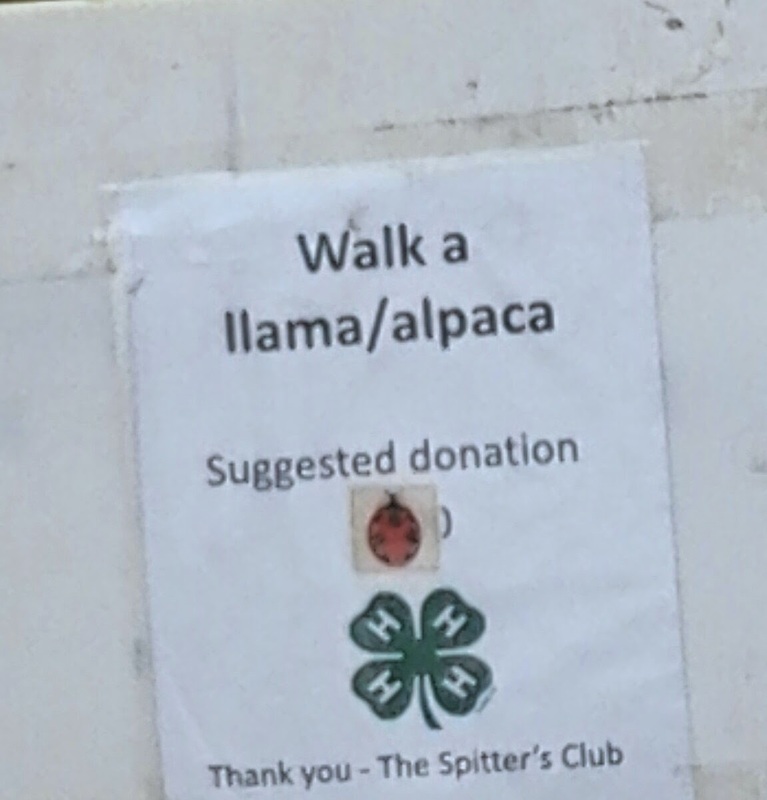 As long as the yarn fumes and excitement of accomplishing a bucket list item doesn't fog my memory. Queen for a day is our Wilma. 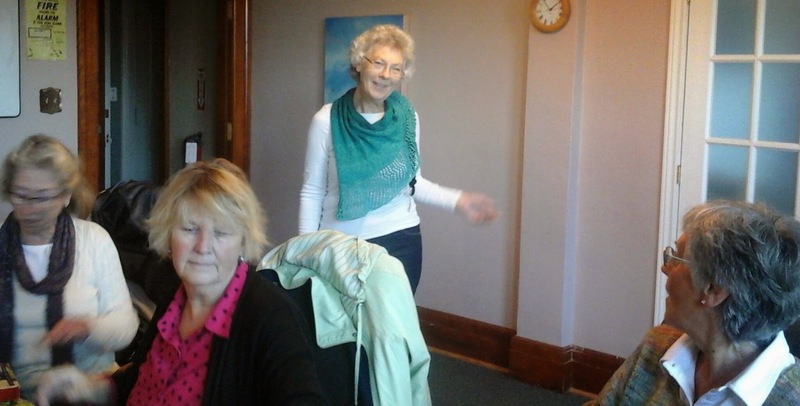 At least when I arrived home from knit group and reviewed the pictures I had taken, it seemed as if they were all Wilma, all the time. Apologies to the other knitters. 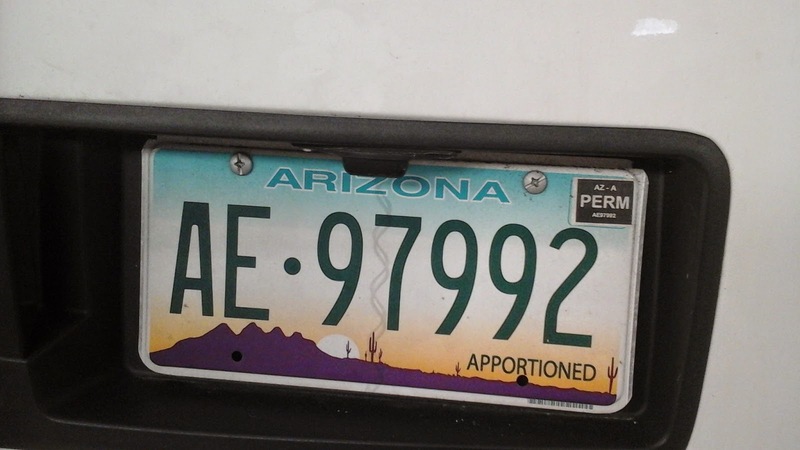 It wasn't intentional. So what was Wilma up to? Well, completed but not yet blocked, is her shawl, knit from a kit she purchased at the KW Knitters Fair. These shawls are gorgeous. An interesting shape, ombre colour shades and various knit stitches really add to the visual beauty. Sharon is, by comparison, close to finishing hers. 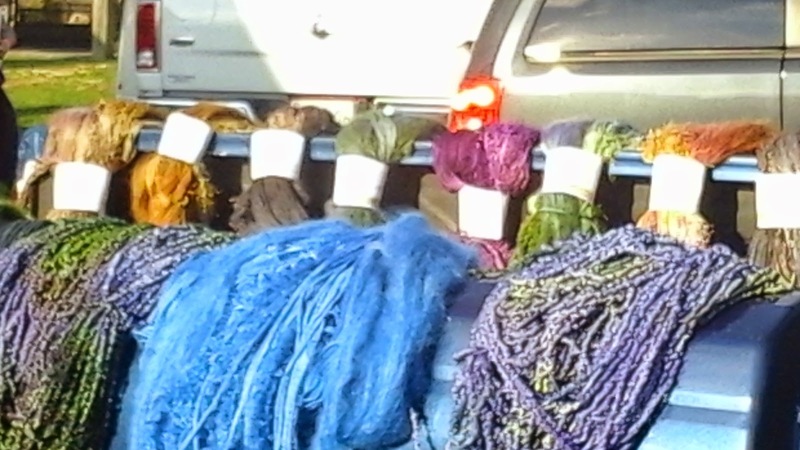 Wilma warned her about yarn conservation. This is how much Wilma had left after the last stitch was cast off. All Wilma, all the time, I tell you, today. 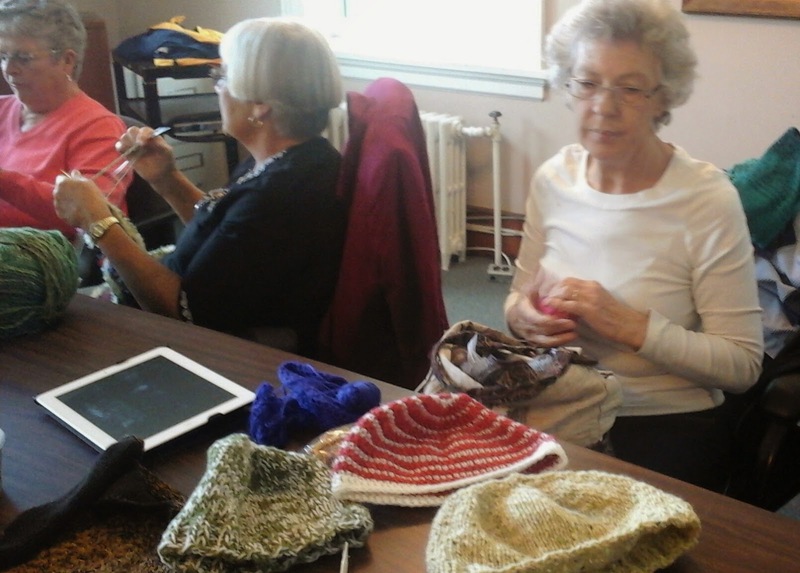 Look at the hats she knit this week for the Christmas box campaign she supports. Sharon R was in a ripping mood today. Here, Ingrid helpd her rip back her cowl. Too thick a piece with 5 strands of Knitting Worsted. Try DK, Sharon. she thinks her hand written copy is amusing. Copied down on the only thing at hand. I don't know, Sandy. Wouldn't every knitter do that? Sorry about the Wilma overload today. I'll try to even things out next time. Until then, to all my Canadian readers, Happy Thanksgiving. Eats lots of turkey, enjoy your families and keep on knitting. 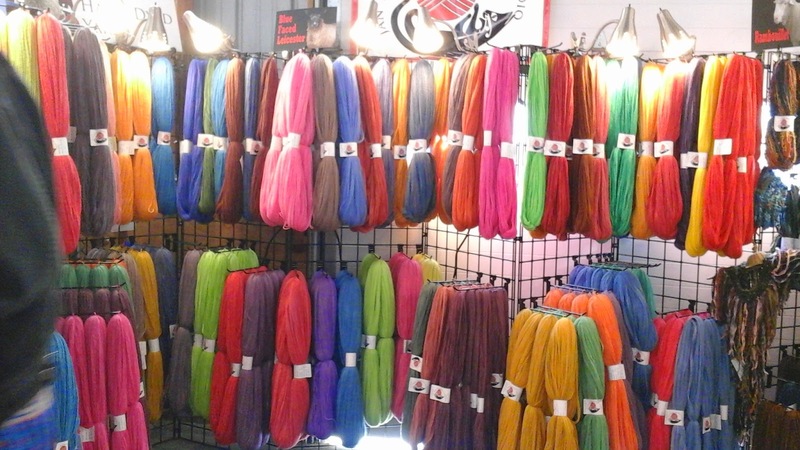 2014 seems to be shaping up to be a low knitting production year for me. I could bore you with reasons excuses as to why that is, but suffice it to say life just got in the way. I like to think I am now back on track - although life might still have something to say to me. But while I'm waiting for that message, I have returned to a lovely little summer cardi. See how life gets in the way? Summer cardis in deep fall. 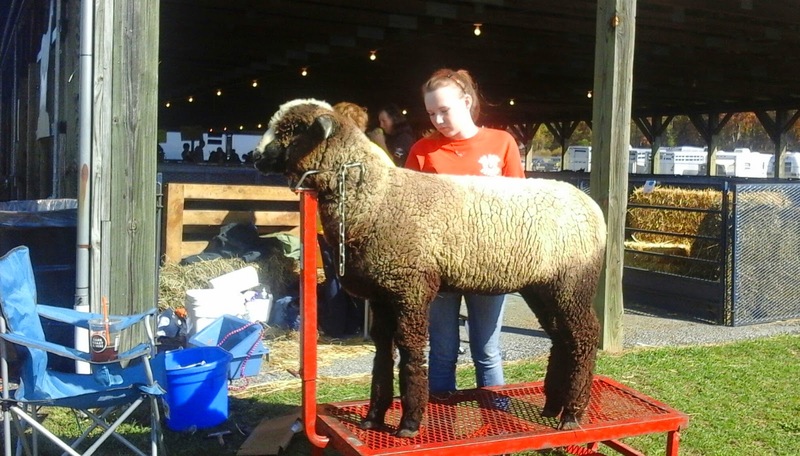 The yarn for this sweater was purchased in early May at the Maryland Sheep & Wool Festival. I started it in the summer, then set it aside for other issues knitting. The trouble with setting aside is that one I forget. I thought I had finished the length so carried on to knit the button bands. Tried it on. Too short. What had I forgotten? 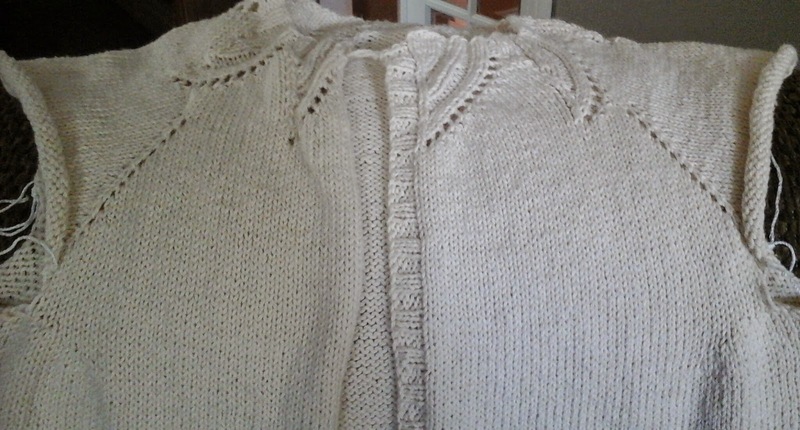 Two things - I hadn't finished the length and try on the sweater before you decide it is long enough. I was shocked! 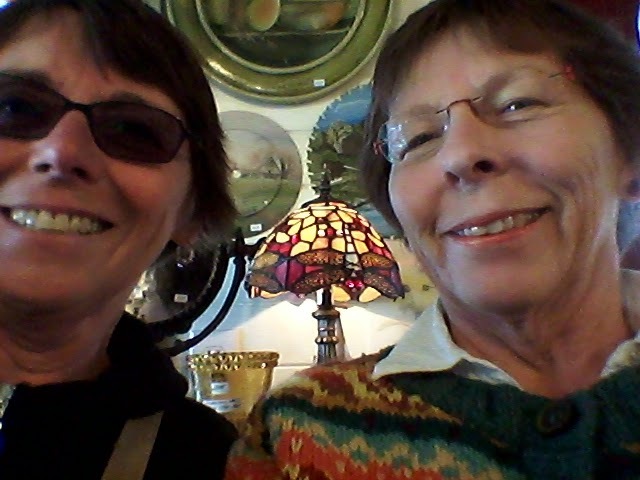 A few posts back, I showed this selfie of Sis and me doing some touristy stuff. Marie of Sel & Poivre commented that she liked the sweater I was wearing in the selfie and had spent quite some time searching for the sweater on my ravelry project page. She wanted details. I was shocked to think that anyone would spend their precious, limited time searching for info about one of my wardrobe pieces. I had knit that sweater long before ravelry existed and have never put it on my project page. Marie's time spent deserves reciprocity so here is the info about that sweater. Years ago, I had my eyes opened wide when I received my first copy of Knitters Forum from The Knitting Guild of Canada. It was a magazine for knitters. Although it finished its life as a sophisticated magazine with beautiful, colour photography it began as a very homespun publication in a photocopied, black and white, stapled format. But what it did for me, I'll never be able to explain. Until that first magazine arrived, I was convinced I was weird, a loner. No one I knew, knit. I had no like-minded friends with whom I could talk knitting. Those not addicted to a hobby cannot understand those of us who are. Alone with my needles, I knit in solitude and shared my passion with no one. Then, one day in a local yarn store, I picked up a flyer encouraging knitters to join The Knitting Guild of Canada. The brain child of Cindy Nicholls, membership offered the magazine, and not much more that I recall. I sent off my cheque and waited for my first issue of Knitters Forum. Even today, I can still remember the feeling of awe, of finally feeling understood, of thinking - there are people out there just like me - that surged through me as I read that first issue. Thank you Cindy. Sadly, eventually the running of the Guild with its magazine, Master Knitting Program and other various and sundry features became too much for Cindy and she gave up her position. The TKGC as I knew it, died. 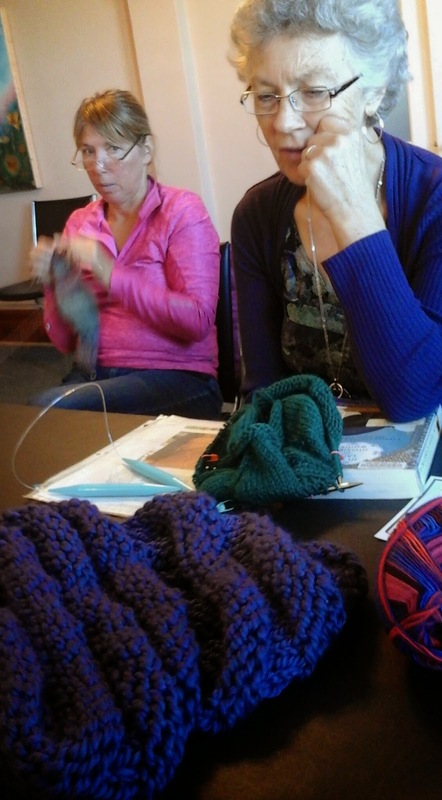 Today there is a Canadain Guild of Knitters but I still miss Cindy. 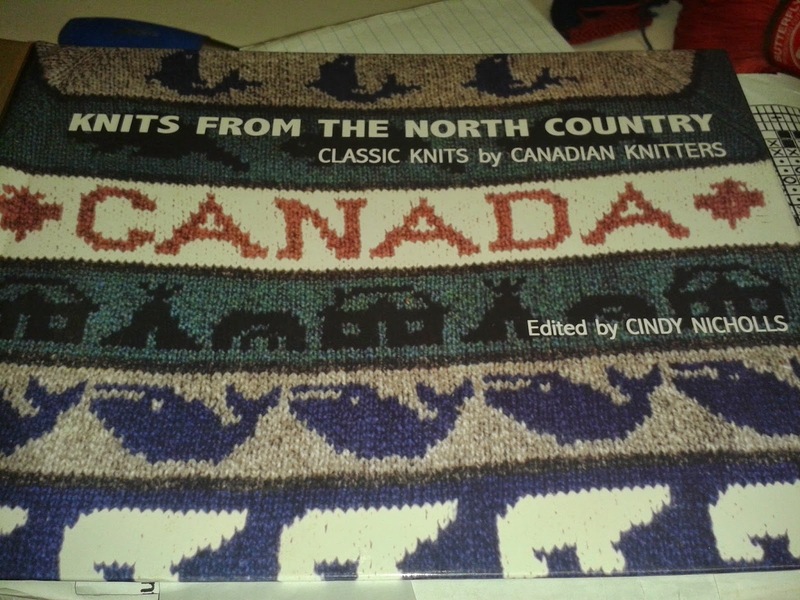 Shortly before giving up the Guild, Cindy collaborated with John Little from Brigg & Little Yarns to publish a book of Canadian designs knit with the iconic B&L yarn. 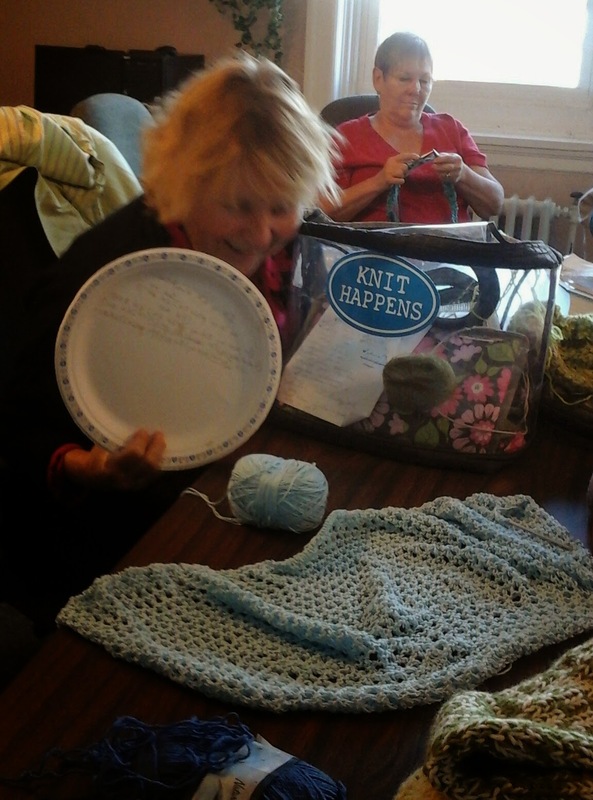 She called for knitters from across Canada to submit their designs for the book and Knits From The North Country was the result. I waited for the book to be published and was first in line at my LYS to purchase it. I couldn't resist such a treasure of Canadiana. Some of the patterns are not at all to my taste but I would have purchased it even if there wasn't one pattern I liked. It tickles my Canadian heart. 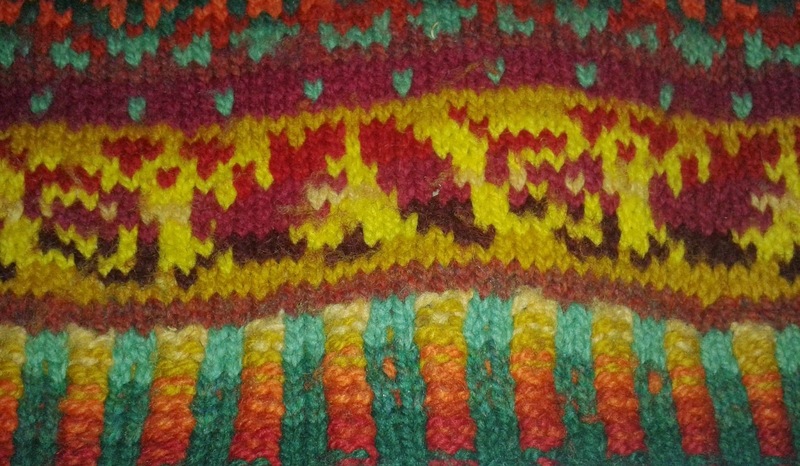 And it was from that book that I chose to knit Prairie Sunset. It was the Saskatchewan design entry, submitted by Rena Bartsch from Saskatoon Sask. Rena's original design featured a coat-length garment but I made mine sweater-length by eliminating a few bands of colour work. There are setting suns and sheaves of wheat cleverly constructed by cabling where the sheaf would be tied together. There are leaves from a variety of tree types falling just above the two-coloured ribbing. 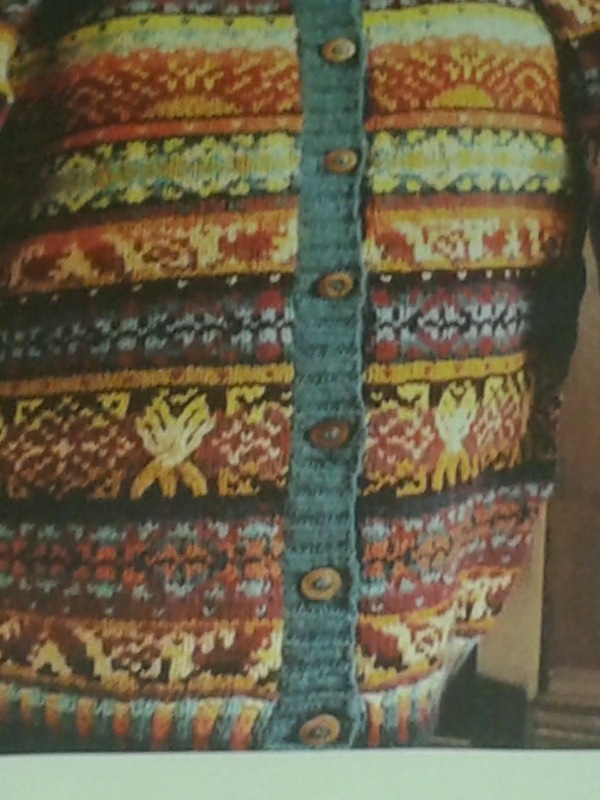 what a beautiful sweater." I believe they still do. Thanks for your search, Marie. It is good to bring this design, the book and Cindy into the spotlight once again.